We're excited to be hosting our 2nd annual user conference, Transform 2018, down the road from our nation's capital at the Convene Conference Center in McLean, Virginia. Last year, the event drew attendees from over 12 different industries including Construction, Energy, Fire Safety, Government, Retail, and more! This year's event is shaping up to be even bigger and better than last year. This full-day event will include 10 different speakers, a special subscribers awards program, and awesome new GoCanvas swag! As you can see below, we have a ton of great speakers lined-up this year! You can check out the full list of speakers and the schedule of events by clicking here. 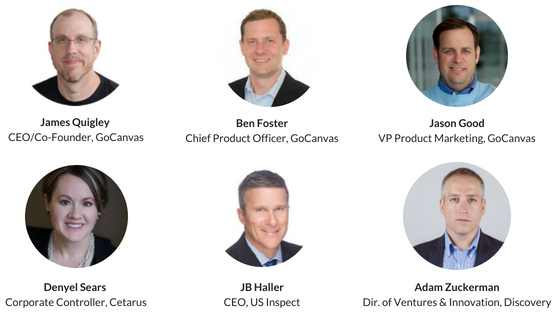 Following the insightful presentations on the many different ways that the GoCanvas platform can be utilized, breakout sessions with the GoCanvas Success and Professional Services teams will be made available for attendees. This is your chance to take a deeper dive into features that you may not know much about yet or to simply have questions you have addressed. By attending Transform 2018, you'll not only get to meet and learn from the GoCanvas team in-person, but you'll also get the chance to network with other GoCanvas users just like you. Many times the best ideas for a new app or process comes from talking with other users! Still not convinced to attend Transform? Check out the highlights from Transform 2017!